This is my 15th installment of Babywearing Stories 365. Each installment features a babywearer in 1 photograph and their answers to 5 questions. My goal is to normalize, promote and celebrate daily Babywearing, moving beyond *what* we use to carry our babies and shifting focus back on *why* and *where* we carry. I hope to share the stories of moms, dads, and babywearing caregivers all over the world. Enjoy! This is me, (Elyse) with my son, Abram. I was wearing him and he was napping on me while I was making breakfast with my toddler, Holden. We were in our kitchen of our home. I was babywearing in this photo because I am in love with it. I am a big believer in the “fourth trimester”, the whole concept that babies enjoy the womb to be somewhat recreated for the first three months of life. Abram is now 11 weeks, and he is worn almost all day. This is also convenient because I have a son, Holden, who is 2.5 years old. 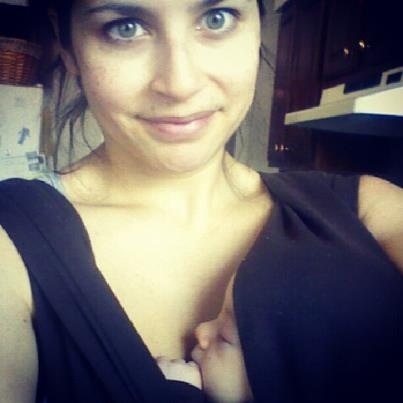 I do not know how parents of toddlers survive with a newborn without babywearing! It allows me to cook, play with Holden, take Holden to the park, playdates, etc. while also ensuring that I’m bonding with Abram and that he’s getting the closeness that he craves – and lets him take naps while we’re on the go!